New. 1974930343 Special order direct from the distributor. New. 9 CDs. Intended for a young adult/teenage audience. We hear about this book but don't seem to get around to reading it as there is so much else to absorb about the environment. A timeless, compelling, and "standard" work that continues to provoke and inspire. The book was as described and arrived promptly. I am fully satisfied with this purchase. Chemicals are threatening the whole environment. Plants, animals and human beings are in danger because of greedy and ignorance. The rise of cancer, and rare alergies and respiratory diseases could be exaplained by the abuse of chemicals. This book is a must read for anyone who cares about humanity and the environment we inhabit. Ms. Carlson skillfully explains how species, including humanity, don't live in a microcosm, but are instead enmeshed - on a global scale - with every other living species. She clearly demonstrates the folly of believing that we as humans are somehow separate and distinct from the rest of creation. 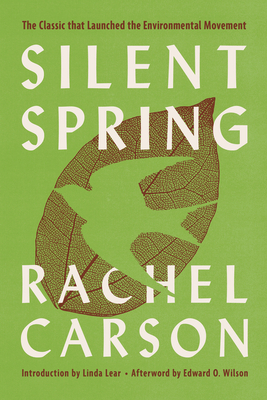 Although "Silent Spring" was written over 50 years ago, it's message is as powerful today as it was when it was written.